2019 Apple Festivals in Canada - Where, When and More to Find an Apple Festival Near You! Looking for a apple festival in Canada in 2019? (just scroll down the page)There is no other listing as complete and current as this list, just updated! All the apple festivals in Canada we can find are listed on this page! If you love strawberries, look for a festival near you below! And I'm always looking for more apple festivals! Please write me, if you know of any to add! I update the dates as soon as the festivals publish their information, but you can always click on the links (usually the name of the festival) to see the current information on the festival's own website. 6804 SW Marine Drive, Vancouver , BC V6T 1Z4. Phone: 604-822-4529. Email: [email protected]. Open: Check our website for current hours www.botanicalgarden.ubc.ca/hours - and - directions. Directions: UBC Botanical Garden 6804 SW Marine Drive @ 16th Avenue Vancouver BC C-20 Bus. Click here for a map and directions. Apple Festival Saturday October 18 and Sunday October 19 11 am to 4 pm. Payment: Cash, only. $4 adults, under 12 free includes FREE entry to the garden. A family event for all ages, the Festival celebrates one of British Columbia's favourite fruits. Between 35,000 & 44,000 pounds of organic, heritage & conventional apples are for sale. Apple pie, apple juice, apple cider are for sale & 100+ varieties of apple trees perfect for the home garden. One of the most popular activities at the Apple Festival is $5 apple tasting where curious event goers can taste up to 60 varieties of apples grown in British Columbia. While supply lasts. NO dogs!. Vernon, British Columbia, Canada. Music, square dancing, apple contest, games, quilting shows and demos. Salt Springs Island, British Columbia, Canada. Apple tasting. Choose which orchards to visit using the map they supply! Vancouver, BC. Event dates: October 15 and 16, 2005 from 11 am to 4 pm. Located throughout the grounds of the Botanical Garden. Free admission. One of the most talked about and enjoyed events in Vancouver. A family event for all ages, the UBC Apple Festival celebrates one of British Columbia's favourite fruits. All are welcome to attend, from children learning about the diversity of apples to those who remember tasting heritage apples in their youth. Every year, between 11,500 and 13,500 kilograms (25,000 and 30,000 lbs) of apples are sold to a hungry public. Also available for sale are many varieties of apple trees grafted onto dwarfing root stock, perfect for the home garden or patio. New owners of apple trees often attend one of the espalier and pruning demonstrations. One of the most popular activities at the Apple Festival is apple tasting. For $2.00, curious eventgoers can taste up to 60 varieties of new and heritage apples grown in British Columbia. Learn the history of those varieties from the Friends of the Garden's "published in-house" Apple Booklet. 200 - 379 Stephen Street, Morden, MB R6M 1V1. Phone: 204-823-2676. Fax: 204-822-1625. Email: [email protected]. Email: [email protected].Open: The Morden Corn and Apple Festival is held annually on the 4th weekend of August; (August 24, 25, 26, 2012). Directions: Morden, Manitoba is located in south central Manitoba, 75 miles south west of Winnipeg via PTH #3 or PTH #75; or 12 miles north of the U.S. border. Our exact geographical location is Longitude: 98 degrees 6' West Latitude: 49 degrees 11' North. Click here for a map and directions. Payment: Cash, Cheque. Click here for our Facebook page. It's Fun and It's Free: Free admission, free parking, free hot buttered corn-on-the-cob, free apple cider, free live stage entertainment on 2 stages, free children's events, free historical bus tours, free shuttle bus service. We are famous for the largest Parade in Manitoba. Wonder Shows midway brings out the kid in all (it's not free but it sure is fun. Also enjoy old tyme dancing, a vintage car/Harley Davidson Show 'n Shine, Tractor Pull, Mud Racing, Crafts, vendors, Farmers Market and much more. All features and events can be found on our web site. Berwick,Nova Scotia, Canada. May be discontinued - their website has not been updated in 2 years. Wolfville, Nova Scotia, Canada. 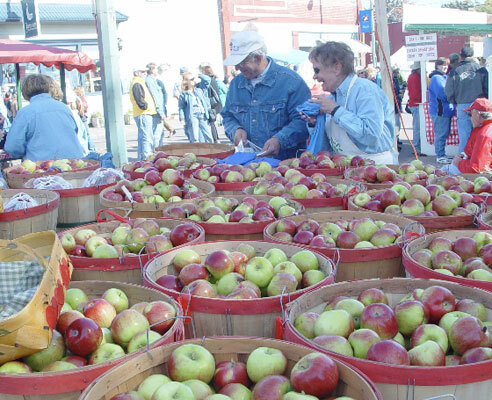 Event dates: 6th Annual Apple Harvest Festival October 17-18-19, 2003. Food and drink, children's activities, music, outdoor farm market, apple produce displays and sales, petting zoo, children's bouncy castles, clowns, magicians, balloons, and face painting. At the Meaford Arena & Curling Clubon Collingwood Street, West Meaford, Ontario, Canada. Event dates: Saturday, September 30th. 10am to 7pm and Sunday, October 1st. 10am to 5pm. Admission: $4.00 12 and under $1.00 Over 200 exhibits to visit and shop at including needlework, leather, blacksmithing, woodworking, colonial tinware, wooden and stuffed toys, collectibles, stained glass, pottery, folk art, paintings in various media, photography ...... and much, much more. Ruthven Apple Festival - The festival occurs every last weekend of September. Ruthven Apple Festival is held at Colosantis tropical gardens . Colasanti's is located in the community of Ruthven, in Kingsville, Ontario, at 1550 Road 3 East, Kingsville Ontario. Great food crafts and entertainment for all ages !!! St. George Village, Brant County, Ontario, Canada. Event dates: every year on the 3rd weekend in September. For over 20 years St. George has hosted our Apple Harvest Festival in Southern Ontario. We offer apples of all kinds, pies, dumplings, craft show, antiques, children's activities, entertainment and much more. Something a-peeling for everyone and it's Free! See this page for a map! Thornburg, Ontario, Canada. Phone: 519-599-3223. Email: [email protected].